Non-Matte Bases for Oily Skin Types and for Every Budget! Oily skin often equates to full or matte foundations as far as many cosmetic companies are concerned but not all of us want heavy coverage or a flat matte canvas for that matter. However there is a few hidden gems in terms of foundations out there that may not necessarily be aimed at oily skin but work wonderfully for a light and/or radiant finish without the need for fancy primers, powders or techniques for that matter. My number one pick is Bourjois Healthy Mix and just to be clear the original not the newer serum which does nothing for me at all. 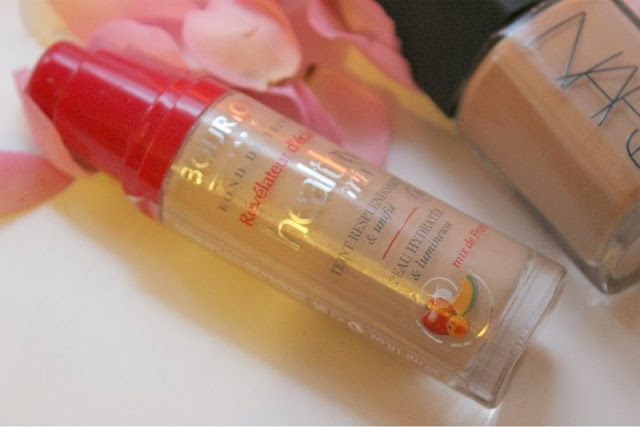 Bourjois Healthy Mix Foundation is one of the few gel formulations that works rather well with my oily skin. It glides on with such ease giving a flawless base with the illusion of a healthy glow despite how tired I may be feeling and stays put all day with a quick dab of pressed powder. Even if my skin does decide to have an oily moment the fresh, dewy finish of this foundation disguises it better than any other. I love it, my skin loves it, my purse loves it and it never fails to gain a compliment or two if you have yet to try it you simply must. I know a lot of overseas readers struggle sourcing Bourjois products but you can find a good variety on ASOS - this particular foundation is £9.99 with free worldwide delivery - link, UK readers can find it via Boots - link and Superdrug - link. I think in the last few weeks I have overly documented my love for NARS Sheer Glow Foundation it is one of those rare discoveries that actually lives up to the hype. It offers medium to high coverage without ever caking, looking or feeling heavy and oddly works rather well with oily skin. It is one of the few foundations that blends so well that I feel at a push I could apply this blindfolded and still be somewhat satisfied with the application. Basically it gives the skin most can only dream of - even, flawless, blurs enlarged pores and provides a natural radiant glow, it is of little wonder why so many brides use it for their big day. Again this wears really well on oily skin with a light dusting of powder and does disguise any signs of excess sebum should the weather be balmy etc. 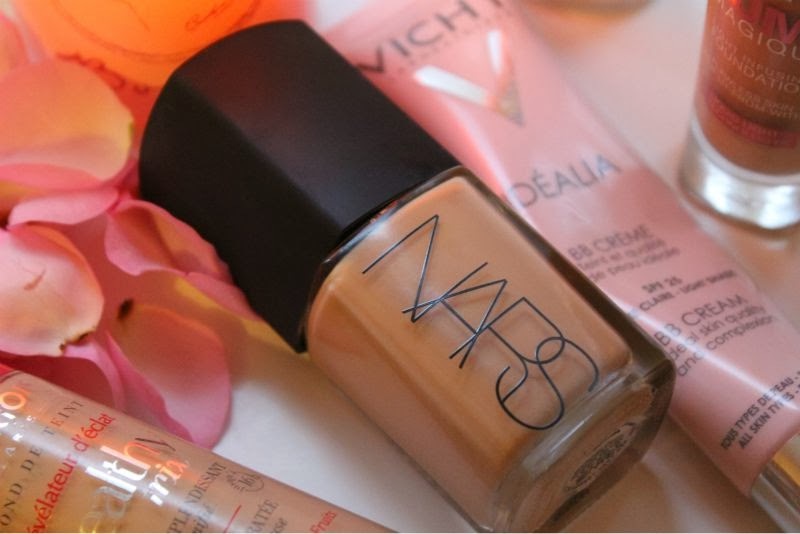 At £30.50 for 30ml NARS Sheer Glow Foundation is far from cheap so you may want to look for a cheaper alternative and the closest I have found on the UK high street is L'Oreal's Lumi Magique which is similar in every way apart from it does need a little more prep work to ensure it wears all day long and the shade range isn't quite as extensive. To make this "work" on oily skin you will have to prime and set it but I'm sure I am not alone in doing that pretty much daily regardless of my base choice? Truthfully I prefer the texture of L'Oreal's Lumi Magique Foundation it is so, so light and feels weightless on the skin yet still achieves moderate coverage with a truly natural dewy finish. I have dubbed this on many occasion as the high street/ drug store Sheer Glow. If you prefer something a little more matte but weightless then I do recommend trying out L'Oreal's True Match Foundation it shares the same texture as Lumi Magique. BB, CC Creams and whatever other new fangled name for the re-packaged tinted moisturisers they can think of don't always bode well with oily skin, in my experience they are too hydrating and tend to melt off within a matter of minutes let alone hours. 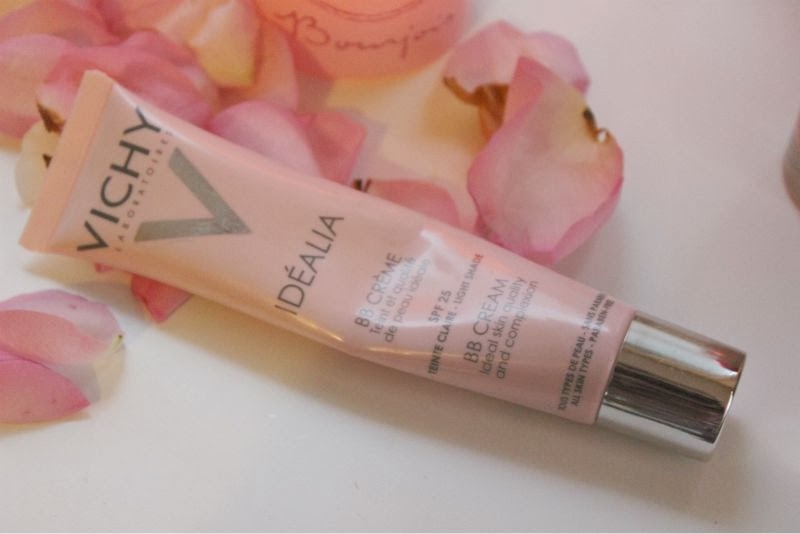 Like every rule there is an exception and that in my case is Vichy's Idelia BB Creme - a light base that covers most skin faults, adds an element of radiance and wears beautifully. So much so that I do not prime or set this with powder when I wear it I simply apply, add a swirl of blush and off I go with the closest I'll ever get to going facially naked in public. I kid you not when I say that this is the best BB Cream I have ever used and with oily skin that is no mean feat. 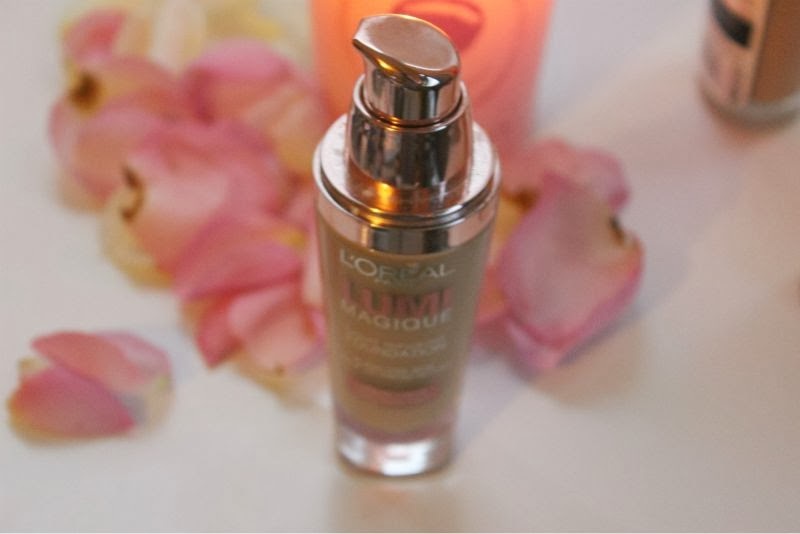 Light, radiant and long lasting - just what every oily chica needs and wants! My last suggestion is one that I stumbled upon in a drug store while in the States earlier this year - basically I ran out of foundation and bought it on a whim, what a shame the UK does not have Covergirl. Anyway if you are lucky enough to have access to the brand Covergirl you must pick up their Outlast Stay Fabulous Foundation. This lighter than air liquid base not only hides the majority of imperfections as well as disguising my enlarged pores with a natural finish (it is not as dewy as the others) but has both a high SPF (20) and a bulit in primer ensuring it protects and lasts the pace of the day. This wears so well on my oily skin providing medium coverage that I am tempted to ship in a good few bottles to feed my habit - it is somewhat similar to Bourjois Healthy Mix yet all together different at the same time, best described is that it gives picture perfect skin without ever being heavy. but it is pricey given how cheap it is in the US. Hopefully if you have oily skin and wish for a lighter non-matte base one of the above options will suit your needs. great post! will have to try out the bourjois foundation. I have heard that the max factor flawless 3 in 1 foundation is the the same product as the covergirl. You know that cov ergirl is what max factor is in europe? Same manufacturer, different brands! Take a look at some of the products and you will notice the dupes with similar names! So go now to your drugstore and have a look at maxfactor! Hello :) yes I know that but sadly the Max Factor foundations or at least the ones that are stocked locally aren't at all similar to this. Hopefully something will come out with the same formula just a different name soon! This is so perfect ! I have been looking for Bourjois products that I can get from the U.S, so thank you so much for that link!! Oh I love a foundation post! I really like the Loreal true match so may need to try the lumi version next! Great foundations!! They all look great for different people..
You've mentioned two of my favourite foundations - the bourjois healthy mix and l'oreal's lumi magique, so I'm excited to try the others too. Great post! 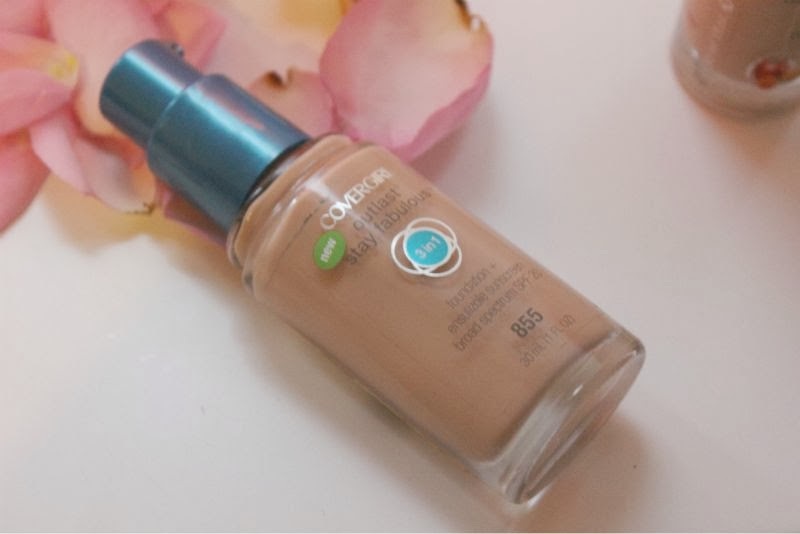 Regarding the Covergirl foundation, in the UK Max Factor is the same brand as Covergirl and they have this same foundation (called "Face Finity All Day Flawless 3 in 1 Foundation"). I've heard it's really good! 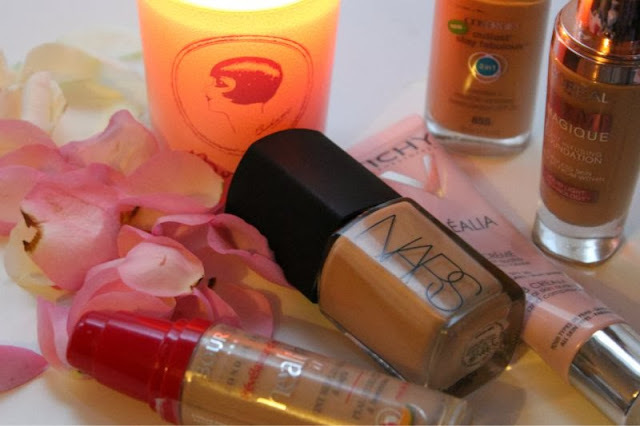 I want to try the Nars and the bourjois foundations so much! NARS is the best. I haven't tried Bourjois since we don't have it here in the states but I've heard a lot of great things about their brand! That is a very interesting post cause usually oily skin go for heavy super matte foundation which tends to mattify too much and create even more oiliness!!! Sometimes the less is better!! Fab post. The Vichy BB is fantastic I agree. After trying almost every highly rated BB I could find I gave up & resigned self to a life without BBs tried this on a whim as I'm a big fan of the idealia day cream & it's fast become a staple.